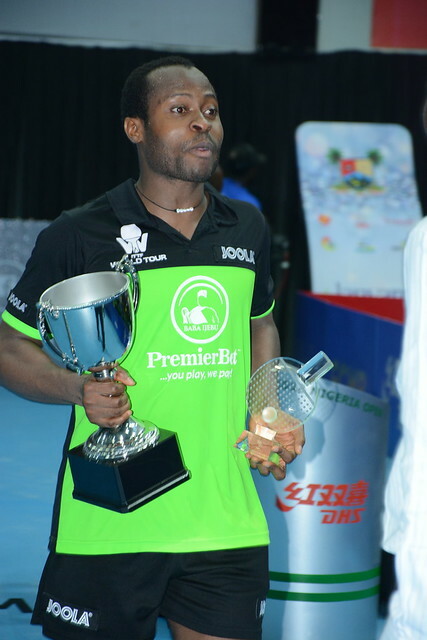 Quarter-final upsets but for the pairs who caused the surprises on Saturday 11th August, there was to be no place in the final of the Men’s Doubles event at the 2018 ITTF Challenge Seamaster Nigeria Open in Lagos. India’s Sarthak Gandhi and Abhishek Yadav alongside the Latin American combination of Argentina’s Horacio Cifuentes and Brazil’s Thiago Monteiro both bid farewell in the penultimate round. In the round of the last eight pairs, Sarthak Gandhi and Abhishek Yadav, the no.7 seeds, accounted for Egypt’s Khalid Assar and Mohamed El-Beiali, the top seeds in a full distance five games duel that ebbed and flowed (12-10, 10-12, 1-11, 12-10, 11-7). At the same stage Horacio Cifuentes and Thiago Monteiro, the no.6 seeds, ended the hopes of the host nation by overcoming Olajide Omotayo and Segun Toriola, the no.2 seeds, in a rather less exacting contest. They won in three straight games (12-10, 11-7, 14-12). One round later it was a different story. Similarly, for Horacio Cifuentes and Thiago Monteiro it was a penultimate round defeat; they suffered when facing the European combination of Hungary’s Tamas Lakatos and Finland’s Benedek Olah, the no.5 seeds (11-8, 11-4, 12-10). One round earlier, in a similar vein to the Latin American combination, they had beaten a host nation pairing, they accounted for Nurudeen Hassan and Azeez Olugbenga Jamiu (11-7, 11-7, 11-6). The final will be played on the afternoon of Sunday 12th August.